While I can blame the busy end of the semester for my lack of blog posts recently, two projects have taken most of the time not consumed by grading and helping students. 1. The Italy trip. On May 16th I will leave with 42 students and three other faculty members for Italy for a travel course to Venice, Florence and Rome. I am the person who deals with most logistics and finances, and that’s been keeping me busy. I budgeted the trip when a Euro cost $1.30. I realized at that time that the dollar was artificially strong against the Euro so I did most of my planning around a scenario where the dollar dropped to $1.45. That wasn’t an arbitrary figure. I looked at the past and found that it is very rare to go down more than 15 cents in four months. Alas, the dollar is now nearing $1.50 per Euro, and the trip threatens to go over budget. This means that we won’t be able to purchase day trip tickets for students (if they choose a day trip they have to pay themselves) or admission into museums. All of that was budgeted into the trip. One reason this bites is that the air fare went up $100 over the original price quoted due to oil price increases. At that point the dollar was still doing well so I decided not to pass that cost on to the students, betting the dollar wouldn’t decline much in the next two months (this happened in March). That turned out to be a mistake. More on the Italy trip as it nears. I will try to blog from Italy, especially about food this time! 2. A new writing project. While I am still working on a research project, I have also started to write a book. The goal: make political economy interesting and accessible to average readers. One frustrating thing about conversations about the budget, taxation or economics in general is that very few people know much about how the political economy operates. That causes people to easily fall for slogans and simplistic claims. People believe things like ‘more taxation means less freedom’ or claims that it would be good not to raise the debt ceiling. More fundamentally, people don’t understand what is happening to the US and how the world economy is changing — changing in ways that are likely to dislodge the US from its perch atop the world economy and continue to imperil the shrinking middle class. A lot of people got used to the idea, popular before 2008, that the US was economically superior to Europe because we had a higher per capita GDP, less regulation and less taxation. Now as the European countries recover and appear prepared for the challenges ahead, the US looks more wobbly than ever. It turns out that the ‘conventional wisdom’ that we were better off was based on a bubble economy and simplistic thinking. Yet most people haven’t grasped the seriousness of the situation, or the fact that our economy remains unsustainable unless we change course. At this point, we can easily turn this around. We are not yet in true crisis. The only way that this will engulf us is if we got caught in political stagnation, adopt wrong headed policies, or do something idiotic like refusing to raise the debt ceiling. Neither the left nor the right are providing a coherent strategy to readjust. The right focuses its ire on the budget deficit. The debt is a problem, but not a crisis at this point. Moreover, until the economy starts growing it would be dangerous to cut the budget too much — when the economy starts growing not only will cuts be easier, but expenditures will fall and revenue will rise naturally. The left focuses on protecting the status quo, but that overlooks the need to react to the changes in the nature of the world economy forced upon us by globalization. My book will be a mix of fiction and serious political economy, designed to be entertaining enough to appeal to average readers, but informative enough to actually educate. I also hope to introduce my own solution. I’ve been writing this pretty consistently in my ‘down time’ from work, but that’s stolen time from my blog. I have no illusion that I’ll actually write a best seller, but I know I definitely won’t if I don’t write anything! For now, I’m having fun with it. If I don’t get it published, I’ll probably roll it out in blog entries (on days I don’t write a new blog I’d give another piece of that book). For now, though, I’m just getting started. No details on that yet, but it mixes history, philosophy, economics and politics, and has a quasi-spiritual angle as well. And I do have a few blog posts in mind for the coming days! Where is the Mideast Revolt leading? Tunisia and Egypt are looking like success stories early on. Libya is a mess. Syria looks like it could be the next to fall. Pressure in Iran is growing, and the small statelets of Bahrain and Yemen face on going unrest. Yemen’s President Abdullah Saleh has already said he’s stepping down, but unrest continues. This will take awhile to play itself out, and before it’s over even Saudi Arabia is likely to experience regime change. All of this is good news in the sense that the old order was obsolete and doomed to fall. The Arab people have been victims of governments bolstered by oil hungry powers willing to enable corrupt and ruthless tyrants in exchange for their black gold. That can’t last forever, and the mix of the information revolution and demography have pushed the region to the tipping point and I suspect there is no going back. In 1982 Assad could kill tens of thousands to maintain authority, but now images and angry flow across the country and world in a way that undermines the capacity for dictators to engage in the most severe atrocities. The bad news, of course, is that the region does not have a tradition of stable democracy, and if anything the authoritarian rule of recent years has reinforced the tradition of ruthless power politics inherited from the Ottomans. And while Turkey had Attaturk, leadership in the Arab world is diffuse. So where will this unrest lead? 1. Those who fear too much, and those who hope too much are probably wrong. One view is that this will be a peoples’ revolt leading to stable modern democracies throughout the region. Another view is that al qaeda and Islamic extremists will use this to grab power and that this will be a victory for Islamic extremism. Both views are naive. The former is naive about the difficulty in having a culture shift from pre-modern practices to a functioning democracy, the latter naively fears a force that does not have the hearts and minds of the people of the region. Some people are very comfortable fearing Islam and thus enjoy imagining it as an existential threat. 2. Iran is the most likely to succeed. Some might think it odd that the one theocracy is most likely to end up with a modern democracy, but Iran is already half way there, with a culture more modern and with less of a tradition of ruthless oppression than the states of the Arab world. Iran (which is not Arab) was never part of the Ottoman Empire, and had a period of secularization under the Shah. It was a modernization done too quickly, too ruthlessly and with too little respect for existing traditions, but it has left its mark. The Shah failed where Attaturk succeeded because he never had Attaturk’s popularity and was seduced by the West to serve as a pawn in the Cold War and energy games. This made him feel comfortable with personal power, and focused less on his country than his own rule. But anyone watching the 2009 protests know that the Iranian people want change. Anyone who has followed the history of post-revolutionary Iran know that modernization has been continuing despite theocratic rule, and that democratic elections do take place, and are hotly contested. The Guardian Council has been keen to avoid pushing the public too hard, and has shown a capacity in the past to reform. At some point an internal coup could push less conservative clerics to the top and usher in a transition that could be gradual and popular. An Islamic democracy may not be like a western democracy, but it can be truly democratic. Iran may be closer to that point than a lot of people think, and the changes now are more threatening to Iran’s leaders than people realize. 3. This process will take decades with numerous ups and downs. Gaddafi could leave Libya tomorrow, Syria’s government could fall, or Gaddafi could hang on for years and the son of Assad could channel his father’s ruthlessness in asserting Baath party control. Likely there will be dramatic successes like Egypt’s and major disappointments. Authoritarian regimes will cling to power as long as they think they can win– and most remain in denial of the forces conspiring against them. This means that it will be a long time before we can truly judge the efficacy of NATO policy, the UN or the US. It also suggests that oil price increases will continue, forcing us to move more quickly on alternative energy sources, as well as developing domestic oil and natural gas (especially from shale natural gas fields — a potentially very rich source). It also means that those who espouse hope and those who convey fear will each find a lot of evidence for their beliefs. You can see that in Egypt where both sides find ample evidence to prove that their hopes/fears are legitimate. Standing back, though, one has to recognize that the old corrupt authoritarian tyrannies of the Arab world have to go. No transition will be smooth. Tunisia and Egypt are doing probably as well as one could hope for, but expect controversy and messy situations in each country for years. Look at how Nigeria is 12 years into its 3rd Republic and elections are still marked with charges of rigging and some post voting unrest. These transitions take time. If the transitions going well take time with numerous ups and downs, places like Libya and Saudi Arabia face the potential that their transitions could take over a generation. Once the Saudi government starts to lose control, oil crises will be likely. It will be tempting to think there is something we can do to “fix” things: Either prop up the old tyrants or intervene to create a new democracy. The former would be a mistakes because the tyrants are being overthrown by their own people thanks to the force of the information revolution and ideas imported from the West. It would be wrong to help the dictators stay in power, and ultimately self-defeating. They will fall, and we don’t want to be seen as being on their side. The latter simply is beyond our capacity. We’ve seen that in Iraq and Afghanistan, and Libya is a fresh example. Libya may be a more realistic way to help — give assistance to indigenous freedom fighters — but it risks sucking us in to a difficult long term quagmire which will likely lack closure. Even after Gaddafi goes it will be a long time before the transition is complete. In short, we are watching a major historical event, the start of a transformation of the Arab world away from authoritarian corruption towards modern democracy. It won’t be the same as the West, but it’s almost certainly not likely to revert to Islamic extremism. It’s a new era, and we need to have 21st century thinking. Perhaps the most dangerous thing to do is look at all this through 20th century political perspectives. A world in motion requires that our thinking be in motion too. Over the next few months I’ll reserve some blog entries for a project we’re planning to undertake this June – to switch our heating source from fuel oil to geothermal. When the installation takes place I’ll describe it, and then later blog about the efficacy and savings from the switch. Today I’ll describe our plans. The work will be done in early June, and have two stages. First the well drillers will come and increase the depth of our current well. If the water flow doesn’t increase then the depth of the well, currently 360 feet, will have to be expanded to 800 feet. If water flow increases or they figure out a way to bleed the flow (in the coldest temperatures this would be about 10% of the water) the price and depth of the well might be a bit less. This kind of system works well in Maine, though in most of the country water tables are too deep for a standing column well to make sense (a slightly more expensive to operate loop system is used in those cases). The water will be pumped in to the heat exchange pump and then returned to the well. We will continue to receive our domestic water supply from the well. Once the well drillers get their work done, the heating people come to install the unit. The heat pump will be in the basement near the current oil tank and well water entry point. The heat will be transferred up to the attic where all the fans and the ductwork will be located, ready to send heat to the house. The heat pump will be a five ton unit. Apparently unlike most forced air systems geothermal heat is low air flow, meaning that the temperature remains constant, but doesn’t rapidly decrease or increase on demand. The total cost will be near $40,000, though after tax credits that should be just under $30,000. At today’s fuel prices that could pay for itself in less than ten years. Even if oil goes back down it will eventually save more than its cost — and I’m sure we haven’t seen the last oil price spike! Moreover, it will significantly cut down on our green house gas emissions. The cost would have been less if the house had been designed with geothermal (it was completed in 2006). Currently it is a baseboard heating system and will require a retrofit to a forced air system. Our house has about 3400 square feet of heated space. It’s a ranch with a finished basement. The basement creates a problem for a retrofit because there isn’t room in the ceiling for duct work. Instead they’ll creatively work through closests to get a number of ducts sending heat to the basement in winter. It likely won’t do the whole job so on the coldest days we may burn some oil. Moreover, while it will help heat water (especially in summer) much of our domestic hot water will also come from our oil burner. Still, the cost savings should be significant. Moreover, it will give us air conditioning in the summer — we have no air conditioning system at this time (not even window units), so that’ll be nice. Maine doesn’t get too hot in summer, but there are always weeks where it gets intense, and it’s often too hot to cook indoors. It’ll be nice to have AC! The decision to do this isn’t taken lightly. It is a major up front cost. Its a no brainer given tax credits to do this on new construction — but a retrofit is much more expensive (not to mention that in buying the houses we paid for the current system, now destined for back up duty). Moreover, we made this decision last November, when oil prices were low. My thinking was that oil prices were not going to stay low, and once they rose again when the world economy picked up, changing our system would be more expensive and there would be a longer wait (as it was our wait was simply to avoid having to have the well work done in the winter). You see, I’ve had this knack of being right about trends. I argued back around 2000 that the dollar would end up significantly lower in value vis-a-vis the Euro, and wished I could buy a large chunk of Euros as an investment. I was right — but had no excess money to buy Euros. I was warning my classes about al qaeda in the 90s, and talking about the coming housing bubble recession by 2005. During the 1998 dot com boom I told classes “there hasn’t been so much optimism since 1998.” Yet I did nothing to personally profit from my predictive ability, except to shift my retirement account to safer investments. Lately I’ve become convinced that large oil price increases are on the horizon. All that can prevent it is a mix of increased domestic oil drilling, a shift towards oil sands, and a large increase in alternative energy use. All of this will happen — reality and markets force change whether people like it or not — but it appears likely to be a very difficult transition which could see a sustained period of very expensive oil. While I doubt the absolute gloom and doom of the peak oil folk is right — I have a bit more faith in our ability to innovate, adapt and react — I also am skeptical of the ‘it’ll be a slow easy transition’ folk. So rather than risk being right again but having done nothing to prepare myself, I pushed hard for us to make the decision to take the economic plunge. I’m teaching overload courses to help pay for this, and unless something unexpected comes up, we’re going to do it. It will feel good too to think I’m doing something about both foreign oil dependence and global warming. So if all goes according to plan, I’ll blog about this topic again in early June when the work is underway! I noted awhile back I was reading Columbia physicist Brian Greene’s The Hidden Reality and trying to get my mind around just where theoretical physics is taking us these days. It’s mostly conjecture, though often buttressed by pretty sophisticated math. All this begs the question why do we even have a reality? Our minds have trouble with that question because it’s hard to imagine something without a clear beginning or causal explanation. To get a universe you have to get something from nothing. To get a God there has to be something from nothing. If time stretched back an infinity, how could we reach the present? Of course, part of this is simply that we’re limited in perspective by inhabiting a space-time universe where we move from past to future able to explain what happens by looking at how nature operates. We live in a world where you don’t get something from nothing, where things happen for a reason, and everything we imagine had to come from somewhere else. Clearly, the universe must reach out beyond space and time. Modern physics suggests that as well. String theory posits ten dimensions; we only experience three (or four, if we include time). Holographic theories even see the reality we experience as a kind of projection from elsewhere. To answer the question “why is there a reality” or “why is there something and not nothing,” we have to change our perspective. It’s like the old joke “A cowboy rode into town on Friday, stayed three days, and left on Friday, how is that possible?” If you get fixated on Friday as a day, then you’ve got an impossible dilemma. You might try creative answers (he rode in on Friday but didn’t stay there and rode around for the next four days before actually staying), but that gets silly. The only way to answer that question clearly is to recognize that the frame of reference is wrong. Friday is not a day, but the name of the Cowboy’s horse. Suddenly it makes perfect sense – and is far more parsimonious than some contorted explanation. We need to think outside our three dimensional box. We try to understand the world as having to fit into reality as we experience it. Either we throw up our hands and say “it’s meaningless, we just live, die and that’s it” or we find some belief to hold on to, or choose to have faith in teachings proclaiming themselves to be the answer. In religion the God concept emerges as the point of mystery, the source of a reality we cannot grasp. The Tawhid in Islam is a concept that God is one — perfect, incomprehensible and indivisible. Hindus have the Brahman, the supreme and universal spirit from which the universe emerged. It is the source of the material world, but its essence can only be known from inner meditation. Both would be consistent with the idea of a holographic multiverse. Even the Christian God is often put in impersonal terms — the Word, the Alpha and Omega, the Spirit. Yet while Christians do personalize God, Muslims see God’s nature as so incomprehensible to the human mind that it is forbidden to try to make an image of it, or give it human traits (God cannot be angry, jealous or sad — such petty human emotions would be beneath God and in fact to attribute them to God is extremely disrespectful.) For Hindus, despite starting from a similar point, anything goes in describing God. Brahman encompasses all so God can take a multitude of forms. Hindus appear extremely polytheistic, but ultimately there is only one Brahman. If the source of reality is outside not only of space time, but of our capacity to even reflect on the nature of its existence, a God or Spirit concept is a shorthand for an unknowable (and least through material inquiry) source of reality. In this view there is one key difference between science and religion. In science the source of our world is likely impersonal, a force of nature that can be explained and studied (or perhaps not, if we don’t have access to it in our three dimensional space-time world). In religion there is a sense of will or consciousness that not only constructs our world but gives our spirit life. In such a view the nature of reality is consciousness, not just material cause and effect. Consciousness would have some immaterial connection to that larger reality that cannot be measured or understood through science or investigating the nature of material/three dimensional reality. This “spirit” thus is key to both self-discovery and understanding the nature of our world. In that sense scientists are looking to math as the abstract key to transcend the limits of our capacity to make sense of explaining the origin of material reality. The hope is that we can find a way to test it or see into a “larger reality.” Religion and spirituality represent a similar effort, but one done through internal reflection and meditation, hoping that access to a ‘hidden reality’ or other dimensions can be achieved through exploration of the mind and consciousness. If the consciousness/spirit theory is correct, the good news is that life is probably unending and expansive. This existence is only a part of what we are, and we will likely never cease to exist. In fact, if consciousness projects reality, we are probably all part of some greater unity. As in Plato’s allegory of the cave we are living in a world of illusions, shadows on the wall, and mistaking it for reality. But if reality is just impersonal forces of nature, then we may be condemned to never truly understand it; our capacities are too limited. Just as a cat will never understand general relativity, we cannot perceive beyond our horizons. So I for one will continue to explore thoughts, consciousness, dreams and intuition on the possibility that perhaps that’s a key to understanding a world larger than this one. If I’m right, a journey inward may yield rewards and lessons. If I’m wrong, well, as long as I have some fun and treat this effort playfully, no harm done. OK, note a couple of things. The relative percentage of income held by the top 10% of the population has been steadily increasing since the late seventies, now at a level greater than any other time in history. As I noted in my post last December on the tax debate, this correlates with a decrease in tax rates for the wealthiest. Moreoever, while there has been little real growth in wealth for the poorest, the richer you are, the more your wealth has increased in the past three decades. The wealthiest 10% of Americans are wealthier than anyone other country’s top decile, while the bottom 10% are way back, below Greece. (Charts for this stuff can be found on that December post). Next, consider the Gini co-efficient. Created by Italian sociologist Corrado Gini, it is a well regarded statistical analysis of the distribution of wealth in a society. To reach 1.0 all wealth would be in the hands of one person; to reach 0 everyone would have equal wealth. Note that the OECD average before taxes is 0.45, while the US is at 0.46. This suggests that the pre-tax distribution of wealth in the US is pretty close to average for the industrialized world. 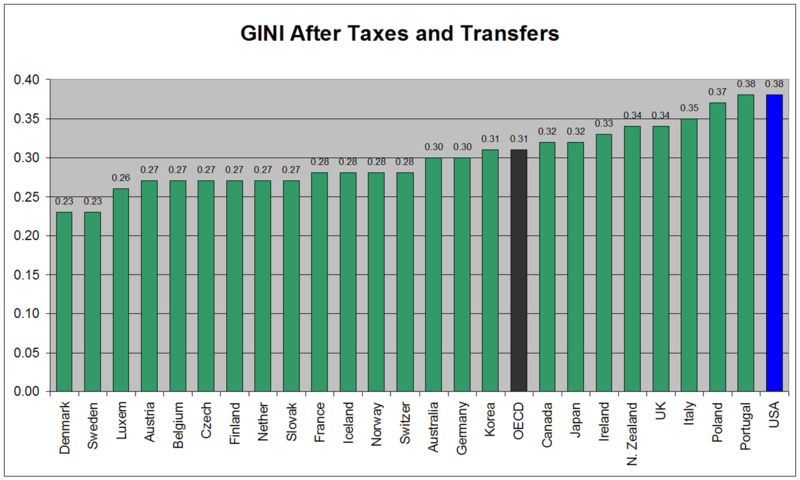 However, after taxation and transfers the OECD average is 0.31 while the US is at 0.38. Taxes have meant a transfer of some wealth to the poor, but not a lot. The US is in fact last among the OECD states in that regard. US taxation appears to be the least progressive of any industrialized state. 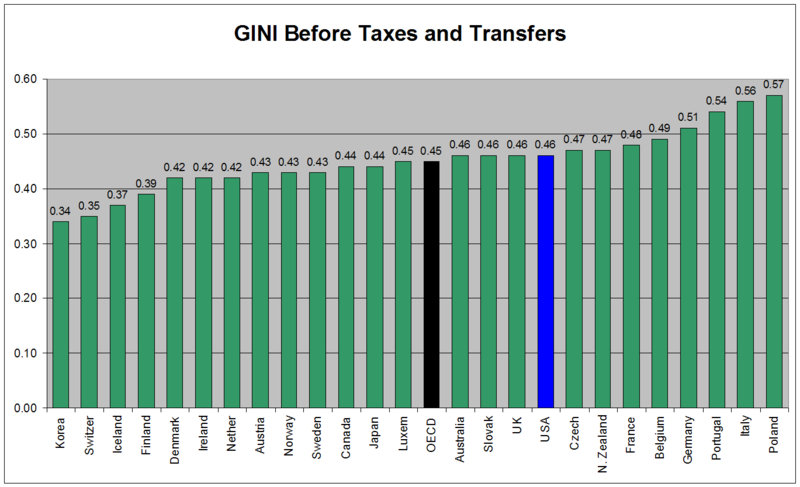 Portugal is tied at .38, but it’s pre-tax/transfer level was .54. Poland is next at .37, but pre-tax/transfer it was .57. Some like Germany begin at .51 and taxes and transfers move them to .30. As far as the Gini index is concerned, the US has more in common with China, Venezuela, Mexico and Argentina than Western Europe and Japan. What does all this mean? Combined with the argument I made last December I believe this is a strong argument for significant tax reform. I agree with blogger Vern Kaine that the “tax the rich” mantra is often used purely for emotion, and that tax increases to the wealthy tend to be accompanied by deductions and loopholes that do them no harm. That is why simply increasing the percentage taken from those earning higher may do little to improve the problem. I could use this information to argue for greater transfers of wealth through taxation and government spending in order to move us further towards equality on the Gini index. I am not doing that now. Right now I’m arguing that the evidence is strong that given our budgetary mess we can ask the wealthiest Americans to contribute a bit more. There is significant tax revenue that can be gained relatively easily, and likely with little harm to the economy. According to a New York Times “balance the budget” application, there are ideas already on the table to do that. Going back to the Clinton era estate tax would bring in $32 billion by 2015, $104 billion by 2030. Allowing the Bush cuts to expire on those earning over $250,000 would bring in $54 billion by 2015, $115 billion by 2030. Payroll taxes for money earned over $106,000 would add $50 billion by 2015, $100 billion by 2030. A 5.4% millionaire’s surcharge would add $50 billion by 2015, $95 billion by 2030. A plan to eliminate loopholes would gain $136 billion by 2015, $315 billion by 2030. Reducing the mortgage benefits for high income families would gain $25 billion/$54 billion, and a consumption tax would bring in $41 billion/$280 billion. These together could bring in $488 billion by 2015, and over $1 trillion by 2030. If we added this with entitlement reforms such as raising the age of retirement, limiting social security payments to wealthier individuals, and limiting the growth in medicare payments, we’d be in the black easily. If we combine that with cutting military spending, recognizing that in the 21st century we don’t need a 20th century style military behemoth, we’d have excess money to invest in creating a productive future and ultimately we could reduce tax rates for everyone. Tax increases and entitlement reform tend to be lose-lose issues. Yet no budgetary solution is possible without a mix of those. For taxes, I’d NOT recommend simply passing the tax increases I list above. That was just to demonstrate that money is available. Instead I’d recommend a reform of the system that eliminates most deductions and loopholes and is at least slightly more progressive. At least until we get our fiscal house in order we need more taxes. Entitlement reform finds Democratic opposition, often in the form of denying there really is a problem. Wisconsin Representative Paul Ryan’s solution that relies on incentives for finding low cost care runs into the same problem — you can’t wish this away. Most costs are near end of life, and aren’t related to wasteful use of funds. Is it really necessary to spend so much right at the end of life, trying to squeeze out a few more months on the planet, while neglecting to cover so many who have real problems in the middle of life? With life expectancy rates higher than ever, what is wrong with increasing the retirement age? And with the country facing potential economic crisis, why should the wealthy get transfer payments from social security? Ultimately our problems are not that severe. Common sense tax increases, spending cuts, and a new approach to military and defense policy could put us in a position not only to balance the budget but to invest in infrastructure to rebuild productive capacity for the 21st century. We could explore the potential of alternate energies, technologies so solve or avoid problems emerging in the environment, and be prepared for an increasing rate of global and domestic change. We are not facing an existential crisis if we have the courage to embrace a few politically difficult choices and recognize that the only feasible path will be bi-partisan, will require painful compromises, but can yield a much brighter future. A short blog entry tonight, reflecting on life in general. Yesterday morning my two sons (8 and 5) were bored and we decided to get on our mud boots and take a hike. It was glorious! Our backyard opens right into the woods and trails leading to a river (which by mid-summer becomes more like a creek). Most of the trails are still covered with snow, but the melting streams of water heading down to the river, the animal tracks, and my sons’ joy in exploring nature was exhilarating. We were out nearly two hours before trekking back home. I’ve also been reading Brian Greene’s new book The Hidden Reality. You can find a good review by clicking here. The book is about the possibility of multiple universes (or a “multiverse,”) which is a very active field in theoretical physics. It further removes humans from the center of reality, but also poses some paradoxes and quandries that I find thoroughly enjoyable. It also puts life in context — the political and personal dramas of the day are real, but ultimately part of something far greater. My own favorite is the idea of the holographic multiverse. To be honest, I like it because it fits my own philosophy on the nature of reality almost like a glove. It has parallels with Plato’s allegory of the cave, and empiricist philosophers like Bishop Berkeley (who had a Star Trek character named after him). Given the apparent ‘nothingness’ of reality once you dig down deep into subatomic particles, and the paradoxes and apparent contradictions of quantum physics, this kind of theory has the potential to clear that up. Reality’s paradoxes and contradictions come from the fact we take the experience of reality, which is an illusion interpreted by our senses, as being the nature of reality. I could speculate more on what this might mean (and will likely do so in future blog entries), but at base it convinces me that it is too easy to get caught up in the “stuff” of the world or the “common sense” of the culture we are born into. We can get hypnotized to follow a myriad of suggestions thrown our way about what the world is, what we ought to do, what is normal, and what life is all about. Maybe the key in life is to look for what has meaning beyond the external stuff of the world. Connections with people, concern for the emotional state of others, putting spirit and soul ahead of power and goals. And somehow, on a warm spring day as the snow melts, kids laugh and we witness nature shifting to a new season, I can’t help but think that despite all the insanity, pain and hatred in the world, we can enjoy a very beautiful and meaningful existence. President Obama, House Speaker John Boehner, and Senate Majority Leader Harry Reid danced, cajoled, threatened, got frustrated but ultimately ended a marathon series of negotiations to prevent a budget shut down and cut spending by $38 billion. For the most part, everyone is claiming victory, relieved that an unpredictable government shut down was avoided. Clearly, the Democrats realize that they can’t ignore the GOP majority in the House, any more than President Bush could ignore the Democratic majority after the 2006 election. This means that budget cuts are going to continue. President Obama, launching a re-election campaign last week, will try to use this to his advantage. Expect him to take the lead in suggesting new cuts, a tax increase for the wealthy, and expanding discussion over competing budgetary visions coming from the Democrats and Republicans. President Obama wants to go into the 2012 election with a record of fiscal responsibility and a capacity to work with Republicans for reasonable compromises. This was a good first step. 1) High debt, both governmental and private. We need to get our fiscal house in order, which includes spending cuts, entitlement reforms, and tax increases for the wealthier tax payers. We need better oversight and regulation of the financial sector, with an effort to create incentives for saving. I also think we need to move away from the mentality that we want consumers to spend money to benefit the economy. Hyper-consumerism was at the root of the problems that led to this situation, consumption is not the solution. 2) A current account deficit, which along with debt ultimately threatens the value of the dollar. The best way to address this and improve the economy is to find productive enterprises to create goods and services that people want. In other words, we need to produce rather than just consume. The Republicans have to recognize that this might require investments and government support rather than just letting the market do it — markets are not magic. Democrats have to recognize that any investments need to be focused on increasing production and not used for other social purposes. 3) Wars! The US has to re-examine its foreign policy and consider cuts in military spending and commitments abroad. This sounds odd at a time when the US has become involved in yet another conflict, but Libya’s difficulties provide a good opportunity to re-examine the nature of US military and foreign policy. As we enter a new multi-polar era where economic power is more important than raw military force, the US has to consider whether or not our military policies and foreign policy perspectives are stuck in the 20th century. 4) Health care. The GOP can’t repeal the health care reform, but many Democrats are eager to join Republicans to think about reforming it. The focus needs to be on both reducing cost and improving coverage. The OECD average for health care costs is 8.9% of GDP. The US spends near 17% of GDP, and we have a very high per capita GDP. The reform last year isn’t enough to solve the problem, and ultimately if it is to work it needs to have broad support. Conservatives in France, Germany and Italy support their national health care programs. Perhaps with reform and maybe more local control, broad support of effective reform could happen here. 5) Energy. The US has to develop a consensus on energy policy, mixing both more exploitation of domestic oil resources (both shale/sands and oil wells) and real investment in alternatives. This could be the most serious challenge facing us in coming years. Last time a President really offered a vision of energy independence was back in 1980 by President Carter. Low oil prices in the eighties caused Americans to brush it aside; if we had acted then we’d be in much better shape now. This time, we need to take energy seriously. Call me contrarian but I think that dynamic in Washington shows promise. Speaker Boehner and President Obama are both pragmatists, even if their party’s rank and file often want to see politics as war. They each seem committed to problem solving over ideology, willing to accept what they might see as an imperfect solution over doing nothing. So let the hard work begin. The country’s problems are not Democratic or Republican, but ones facing everyone. We all have to be willing to question what we’ve thought to be true, support compromise, and reject emotional demonization of the other side. The problems are real, but not insurmountable.